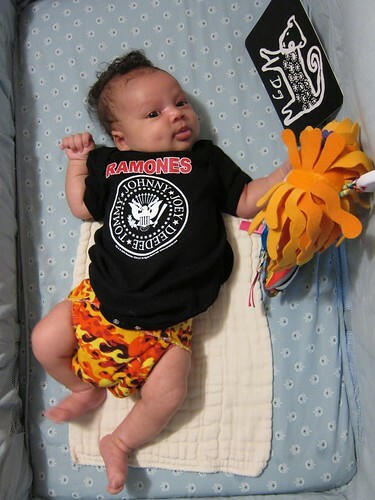 Punk Rock Baby Z, originally uploaded by M1khaela. Also, how cool is her natural curly faux-hawk? (Fro-hawk?) It just grows like that--big and curly down the middle and thin on the sides. More posts coming soon--at six weeks post-partum, I'm even starting to think about maybe possibly someday breaking out my sewing machine again for a quick project here or there (though I'm still basically nursing her every hour when she's awake). Baby girl is growing so fast I should even be able to photograph her in the 6-month stuff I made for her in a week or two (the above onesie was purchased, not me-made). She is so beautiful. I want to run my fingers through her hair. And that flaming-hot diaper is just the right touch. Too cute! Looking forward to seeing you again, too! Thanks for sharing the baby pics. What a precious baby girl! (Good for you for nursing her on her terms. Believe me, you will be glad you did as she will continue to thrive and grow. She will be so healthy and strong). 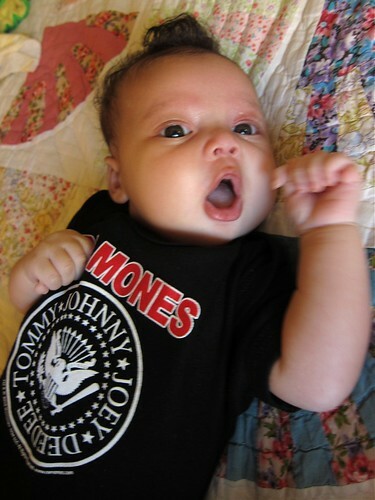 She is completely cute and utterly awesome! Oh yes, definitely nursing baby on her terms. Funny, I thought they were exaggerating in breastfeeding class when they said babies ate an average of every 2-3 hours... but for Z it's really more like every hour when awake, with occasional 3 or 4 hour naps or night sleep periods of no nursing (sometimes, when I'm lucky, at night). I LOVE the faux-hawk. She is such a cutie!